Established in 2000, Zea Mays Printmaking is dedicated to research, practice and dissemination of safe printmaking. We offer studio access, workshops, residencies, internships, mentorships and contract printing services to an international community of artists. Demonstrating the high quality and creative possibilities of original prints made with health consciousness is at the core of our mission. 100+ member artists work in intaglio, relief, serigraphy, photopolymer, monotype, collagraph and mixed media printmaking. “ Zea Mays (Sweet Corn) is a plant known for its ability to extract heavy metal toxins from the soil through its leaves and roots. Just as this plant is being used as a natural way of restoring contaminated earth back to health, our mission is to restore the art of printmaking to a healthy art form. At Zea Mays we honor the rich tradition of printmaking by exploring alternatives that are safe for artists and the environment. 6,000 sq. ft. of printmaking studios. 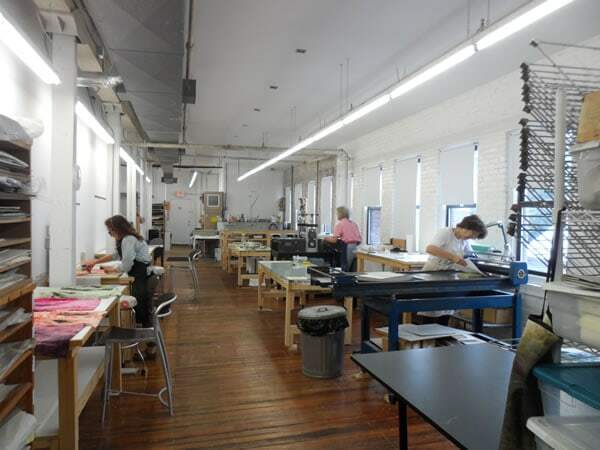 4 separate studios: teaching, members’, screen printing and private (the Annex). a solvent-free, sustainable working environment. research center for safer, non and less-toxic printmaking materials and processes. 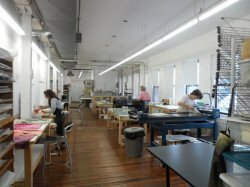 educational facility offering workshops and private instruction in safer and non-toxic approaches to intaglio, photopolymer, lithography, silkscreen, relief and monotype printmaking. print archive, available for exhibition and study. mentorship program for artists seeking to deepen their practice. resource for offsite demonstrations and workshops as well as consultations about setting up a safer studio. a great community of printmakers. Printmaking is an evolving field and we constantly strive to make our studio safer and more sustainable.